After being transported to Earth from his home Planet Sakaar when the world-eating villain Galactus destroyed his home, the Hulk's son Skaar became Norman Osborn's problem. Skaar was hell-bent on killing his father the Hulk and was willing to do so by any means necessary. Osborn did not want this type of savage violence occurring on U.S. soil during his watch, so he planned to stop Skaar immediately. Norman out-maneuvered Reed Richards and the Fantastic Four, who attempted to hault Skaar without brutal force, by bombing Hulk's son in attempt to kill him. This bombing did not kill Skaar, rather, reverted him to a human form, more specifically, that of a young boy. The media reported the death of the savage alien and marked a victory for Norman Osborn and H.A.M.M.E.R. 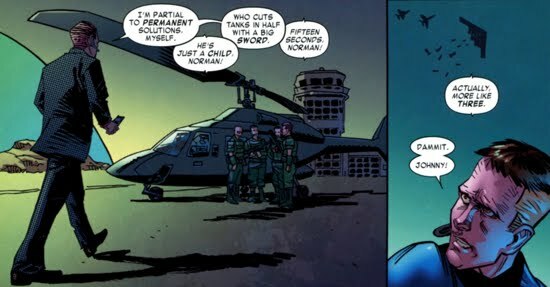 Norman reveled in his victory, but greedily wanted the Hulk killed as well. He used his H.A.M.M.E.R. forces to locate and follow the Hulk's ally Dr. Kate Waynesboro, who had recently fled with the Warbound after Osborn had sent a scientific team to work with her. Waynesboro had been working with Osborn, but she soon fled when she realized Osborn's true intentions. Soon after, Osborn set his sights on taking down Bruce Banner (aka the original Hulk) because he was convinced that the reports of Banner's death were untrue. Osborn charged his Avenger cohort Ares with the task of finding Banner and killing him. Ares is able to track down Banner, however Banner was protected by the Abomination-like creature that was actually Rick Jones (Jones went by the name A-bomb). Banner and Jones are able to trap Ares and escape after they had convinced the God of War that the Hulk was dead. Later, Osborn took Dr. Waynesboro into custody and attempted to extract her Old Power set, deputy director Victoria Hand was in charge of this operation. However, Banner and Skaar breached the laboratory's security systems and freed Waynesboro. It was at this point that Osborn decided the Hulk must be eliminated. Norman sent his Avenger Ms. Marvel and Victoria Hand on a mission to locate and kill both Skaar and Banner. After a chess match between Banner and Hand that pitted Osborntech against Bannertech, Hand was able locate Banner. Bruce was attempting to destroy one of H.A.M.M.E.R. 's research facilities using Osborntech missiles that he had hijacked. Hand and Ms. Marvel arrived on the scene to capture Banner. A mutual hostage situation ensues as Ms. Marvel takes Banner and Skaar takes Hand, an agreement is reached, however, and both are released. Skaar escaped with Banner and Victoria questioned Ms. Marvel's tactics, but Ms. Marvel explained her rationale. The facility that Banner bombed was not a plain old research facility, rather a gamma-lab, which was used as bait to expose Banner to gamma rays and unleash his Hulk persona. Once the Hulk persona emerges, Skaar would than fight it to the death, eliminating at least one of Osborn's enemies. Osborn considered this a victory. 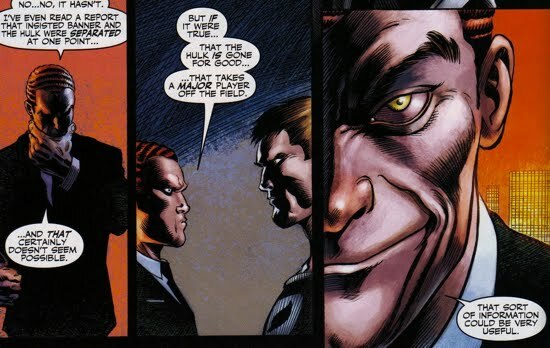 Score this as a victory for Osborn, he certainly beat Banner in their chess match battle. Of course, Norman was never able to reap the benefits of this maneuver since he's eventually taken down from power before Skaar and Hulk clashed, nevertheless...a victory of sorts. The Hulk and the Green Goblin did have a bit of history. Dating back to the Goblin's earliest plots against Spider-Man that involved making a film in New Mexico, Spidey and the Goblin found the Hulk, who was seeking solitude, in a nearby cave. The Goblin used the distraction created by the Hulk to escape Spider-Man. Not much else here, other than to add that besides wine, Osborn apparently enjoys martinis and scotch as well...both drinks made their way into this Hulk storyline. Osborn was depicted as a drinker throughout Dark Reign...guess he gave up nicotine for alcohol.